Honestly, for me, this is by far the most important part of the review. With there being not much in the way of performance upgrades or new features compared to previous generation Airs, the battery life improvement is basically at the heart of what makes the new Air attractive. 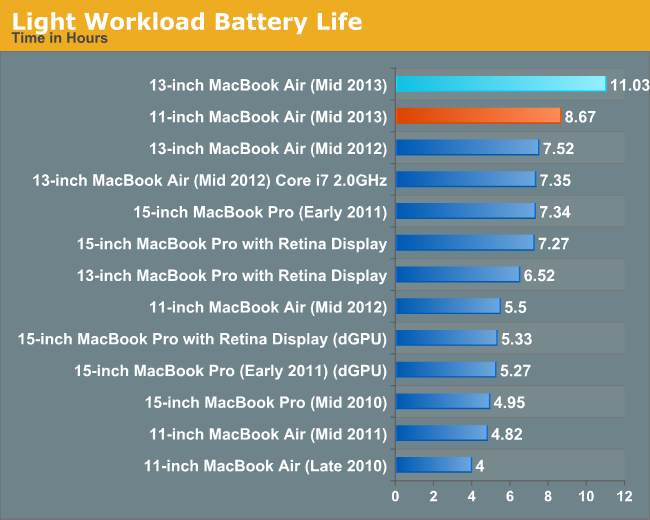 Obviously, this isn’t exclusive to just Apple—any Haswell ULT Ultrabook with 40-50Wh of battery capacity should get you 8-10 hours of battery life. 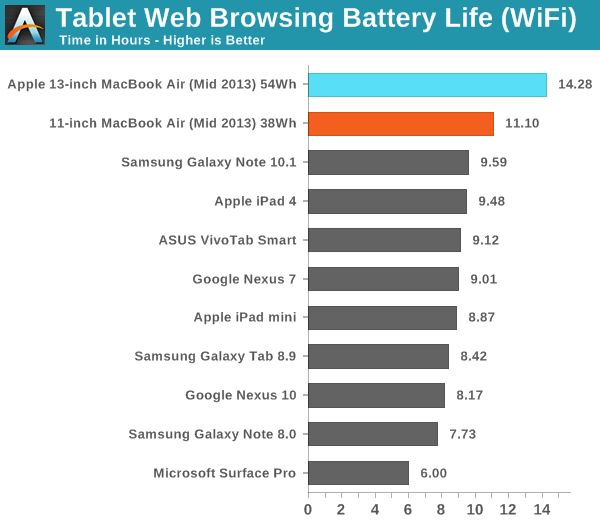 But it’s honestly amazing to use a fully fledged notebook that can battle Atom and ARM for battery life. 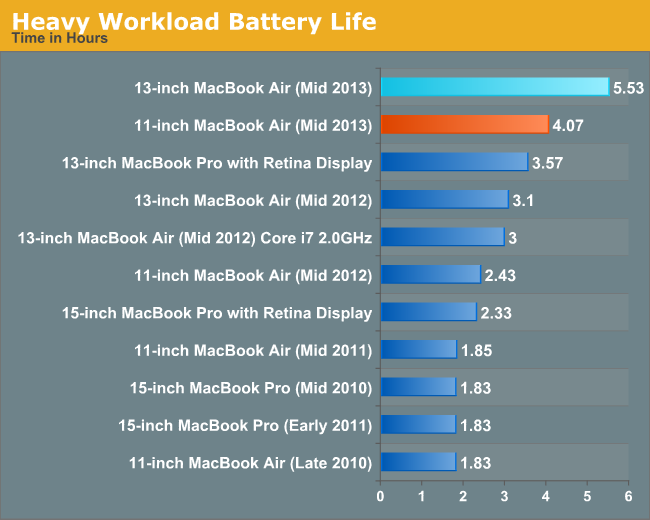 The image from Anand’s 13” Air review showing an estimated 16 hours of battery life was awesome, even if the OS X battery runtime estimate tends to be wildly optimistic in the early part of a battery cycle. The 11” isn’t quite that far, but it still has better battery life than my iPad. Granted, my 3rd-generation iPad now has a year of wear on the battery, but still—it’s longer lasting than my iPad was when new, and it’s also longer lasting than the 4th gen iPad. And not just by a little, it’s a pretty significant step up. That’s a really important corner to turn for the notebook market, double digit battery life without having to resort to an extended or secondary battery like some business notebooks have offered in the past. As Anand covered in his recent Haswell ULT battery life article, Intel still needs to work on the power efficiency of the Haswell video decode engine, since ARM-based SoCs still hold a sizable advantage there. But other than that caveat, the overall power consumption of Haswell is an absolute game changer. I’ve never even thought to take the power cord with me anywhere in the month that I’ve had it. Want to take the Air for a weekend away and not plug it in once, iPad style? Depending on how much of your usage can get pushed to a smartphone, that’s a legitimate and realistic possibility. The 11” Air, by virtue of its smaller display, is slightly more efficient than its larger sibling, but the 42% advantage in battery capacity pushes the 13” Air’s battery life into the insane range. Being able to rely on nearly 10 hours of battery life or more in most normal use cases is just ridiculous. The 11” is a bit less phenomenal, but anything that can claim better battery life than the iPad, even with a smaller battery, is doing just fine. At 8.5 hours dead on in our usual Mac light browsing test, the 2013 11” is three hours ahead of the 2012. That’s 54.5%. It’s nuts, the end. 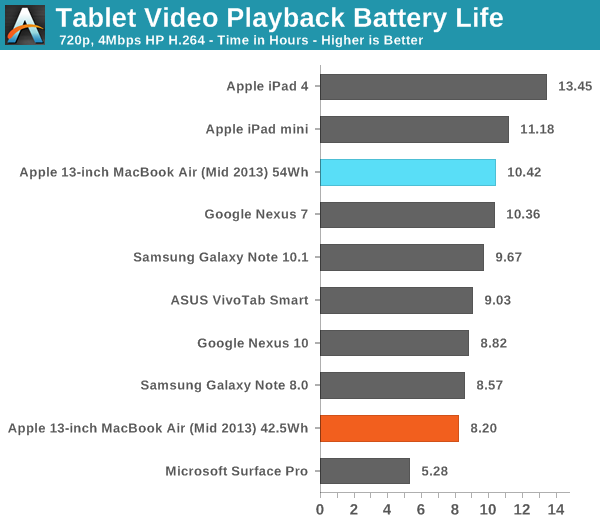 That advantage holds basically through the rest of our more strenuous battery life tests. The previous 11” really had an issue with battery life—the real-world 5 hours of runtime just didn’t cut it given the sacrifices made for mobility; it made much more sense to get a 13”. Now, with 8+ hours of runtime, it’s easier to ignore. The jump from 5.5 to 7.5 hours of battery life makes a pretty significant difference in how the system gets used, but I’m less sure about the difference between 8.5 and 11. Once you’re already in that 8-10 hour battery life range, adding two or three hours on top of that is a lot less valuable than it would be in a situation where you’re adding that amount to get to that range. This isn’t to say that more battery life isn’t always better, just that at some point it becomes something that is nice to have rather than something that changes the essence of the system, almost like the difference between an i5 and an i7 CPU. I don't think it's fair to say people are throwing their money around frivolously here. If you buy cheap $400 notebooks every year (because they aren't built to last very long) or upgrade premium phones all the time, then suddenly buying a well-made decent performing laptop for $1000 isn't so bad. From what I hear, Apple notebooks run for a long time and even resell for a good price, so if you keep this air for 3 years and then sell it for $400, you aren't really being so wasteful after all, are you? I´ll agree to that. 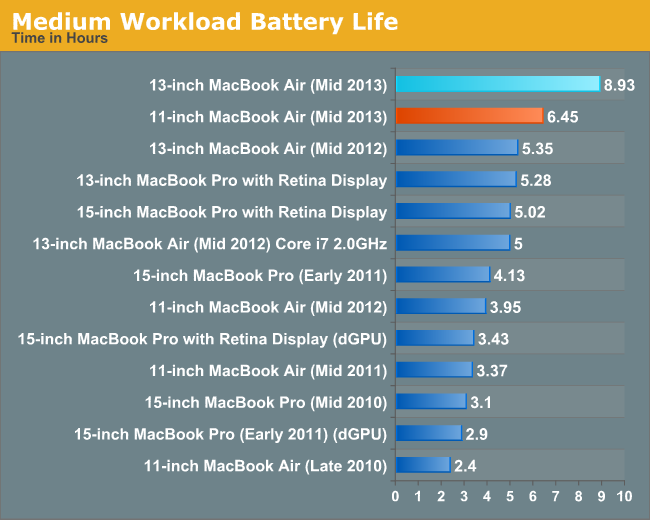 Macbooks are well built and lasts long. In fact, I think mac prices are pretty much what hardware ought to cost.